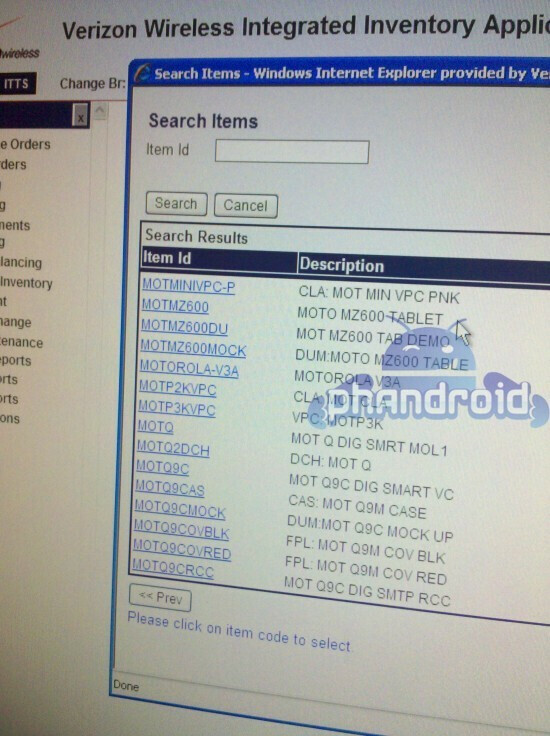 Motorola's rumored Stingray Android tablet has been glimpsed at again on Verizon's internal systems, coded MZ600, as usual. Google, however, commented that Android is making its way onto tablets because it is an open source platform, and anybody can use it in a way they see fit, but, overall, it has not been optimized for tablets yet. El Goog went on to pour some cold showers on manufacturers that Android Market will not be available on all tablets, and its presence will be decided on a case-by-case basis. That's because the great majority of apps, and the Android interface itself, are not optimized for the tablets' resolutions and experience. We know that Google mentioned its next version of Android, Gingerbread, will focus on the interface, and the user experience, thus trying to make it pointless for OEMs to lay custom skins over the stock appearances. Furthermore, there have been rumors that Gingerbread will be focusing specifically on suiting the Android interface for tablet living. Putting two and two together from what we know about Motorola's tablet, the Stingray might very well be the first device we will see Gingerbread on. It has the guts - Motorola will probably be using the dual-core NVIDIA Tegra 2 as a chipset, and the glory - Google is working directly with Motorola on the Stingray. Considering how the DROID became the best-selling Android device, and not only on Verizon, Motorola might be again Google's poster child, for an Android Gingerbread tablet this time. Out of the many rumors floating about Motorola's tablet, we choose to believe in Verizon's roadmap that a tipster sent to us, stating that the MZ600 will be available on Big Red in November. That would nicely coincide with the holiday shopping mania, wouldn't it? Ditto to above. That seems to be a big selling point of Android being an open source system. Sure, we might get a crappy model here or there, but a tablet in November means cheap ones by February.